Many conflicts between neighbours arise as the result of disputes over parked cars. Of course, if you have a separate driveway then there isn’t a problem, as long as you actually park on it, but issues do arise when people park their cars on the road upon which they live. Having off street parking not only increases the value of a property but it also reduce the risk of neighbour arguments over where to park the car. In some residential areas, often London, parking permits are charged at a premium rate and don't always resolve the parking problems, as residents think they have a right to park in front of their house since they have paid for a permit. 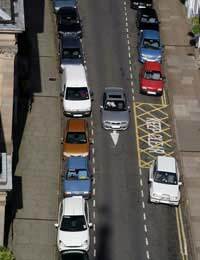 Drivers should all be aware that you cannot park or wait on double yellow lines at any time. You must not wait or park on single yellow lines at the times stated on corresponding signs. You must not wait, stop, or park on school entrance markings. Unless you are entitled to, you must not park in disabled parking spaces or resident parking spaces. You must also not park in front of the entrance to a property. Many parking disputes arise over the failure to observe parking ‘etiquette’ on the street where you live. But etiquette and the law are two totally different issues, so let’s take a look at both. As long as your vehicle is taxed and you are not contravening any other traffic laws, you are allowed to park anywhere on a public highway (but not on footpaths/pavements) where it is legal to do so. Etiquette, good manners and common sense are the main ingredients in avoiding parking disputes with your neighbours. Most people would choose to park outside their own home anyway because of the convenience, but what if you have more than one vehicle belonging to a single property and there are no driveways or you have a driveway but there is only enough room for one car? Basically, it’s an unwritten ‘rule’ that people will generally tend to park outside their own home but it’s important to note that no one has an automatic right to do so. It’s not always possible and, in addition to residents, other road users also have the right to park outside your home providing they are not contravening the Highway Code. To resolve this issue, the only thing you can do is to try to have a friendly word with your neighbour and explain to them why you’d prefer to park in front of your own house. You may find that they didn’t realise it bothered you and often simple courtesy and communicating your issue with your neighbour will resolve the problem. If you share a driveway with your next door neighbour and a parking dispute occurs because of lack of space or one person’s vehicle is taking up more space, you can resolve this by checking your house deeds to find out where the boundaries lie. It’s courteous to share responsibilities for the accessibility and tidiness of a shared driveway. If you have children, make sure you keep any toys off the other person's part of the shared driveway. If your next door neighbour simply decides they’ve had enough and drives straight in and ‘accidentally’ runs over a children’s toy, you’ve no legal redress – it’s your neighbour’s part of the driveway and your responsibility to keep things that belong to you, on your side. This is, by far, the single most frequent cause of annoyance and arguments between neighbours. Unfortunately though, the law does not help in this regard. It's common courtesy not to park directly in front of the driveway of another person’s property. After all, they may need to get in or out of the driveway with their vehicle. If you’ve blocked the access by parking directly in front of it, this will cause the vast majority, if not everybody, to become annoyed and to try to locate the owner of the vehicle to get them to move it. Therefore, most neighbourly people will never park directly in front of someone’s driveway. What is the Relevant Law on Blocking Someone's Driveway? The Highway Code, paragraph 207, asks that people DO NOT park their vehicle where it might cause an obstruction to other pedestrians or road users, and cites the example of not parking in front of another person’s driveway. In essence, while there are certain rules and regulations under the Highway Code relating to parking on public highways, mostly it’s a matter of common decency and courtesy. Speaking calmly to neighbours and explaining reasons why you might need to park here or there, if practical, will usually result in you getting what you want. Just remember, however, that unless they are breaking the law, people are entitled to park anywhere they want to on a public highway providing they aren’t in breach of the Highway Code. If things get really bad, you could try and get a third party involved to mediate...take a look at our feature When Mediation Can Help Neighbour disputes for more information and advice. If you think you could have a case under this piece of legislation, first try to find and speak to the vehicle owner. In a friendly and polite manner, tell them about the act and that you'd like to get your vehicle out. If they refuse, call the police on 101 - not 999 (it's more than likely NOT an emergency and if it is, the vehicle owner will probably cooperate with you anyhow). Tell them about the problem, how long the vehicle has been there and that you need to get your car out. If they say there's nothing they can do, ask them about the Traffic Management act of 2004 (referring to dropped kerbs) and what they normal steps are. They should be able to help you to take the right steps even if they won't do anything themselves immediately. I'm having terrible trouble with my next door neighbour, not just their parking but refusing to maintain their fence, loud music, shouting, swearing, constant fires in the garden plus a hundred other things. When we moved in 3 Years ago they had 2 cars, they soon got another making it 3....which was 1 to many for their drive. So they started parking opposite my drive making it very difficult for me to get out. I mentioned it politely and they agreed to gravel over their lawn short term to provide another space, problem solved... For a few months. They now have 4/5 and sometimes 6/7 when the boyfriend and sister are around (most days) cars parked outside, 2/3 are constantly parked outside my house. Which means I have great difficulty getting out of my drive, we also can no longer have visitors as there is nowhere for guests to park. I asked them to think about their neighbours before they park but I only got abuse in return. So I now park my car opposite my drive due to the great difficulty of getting in and out, this just gets me more abuse. Essentially we are being punished for only having 2 cars, We have now decided to sell the house and move on, on the open day I moved both mycars off the drive so viewers could have somewhere to park, again I got abuse from my neighbours. My neighbour across the road has created an issue since we moved in last November. He has spoken with a number of my guests, some only popping to collect something other. He & his family kick up a fuss if anyone is an inch over his dropped curb. However, on certain days, all his family come over - 5/6 cars at a time (I have pics) and Park where they please. Just now my asda delivery driver was dropping off my food, parked outside my home, but blocked the road. Someone came and complained that the driver had blocked them in - they were parked over the drop curb funnily enough. After the asda driver left, no-one drove the car away. It is still there. So there was no need for them to comment. If there is an immediate issue I could completely understand, it seems they're complaining for the sake of it.. Which creates animosity and a lack of compassion from my side because it is like the boy who cried wolf. I have to add, no one in my house drives, so the issue of parking is nil for me. It just frustrates me that my guests get hassle. It's like harassment by proxy. Any advice on how to deal with this? I really don't want to lose my temper but I'm afraid if it continues then I might. I don't know what to do. One house has 5 cars and 2 very large vans. A drive way, that can fit 2 cars on (which they never use! ) . These vans are parked in public carspace, along with their other cars taken up space for others, at one point there was 4 vans. They come and go all sorts of the day and night. They are either parking so close to other peoples cars, that they struggle on a daily bases to manover there cars out of their usual spot (right outside of there house, the whole street knows its their regual spot) or they are parking in spots that's blocking camera, preventing me from seeing my own car. They know full well who's cars are who's and yet they insist on parking awkwardly for other residents. Frustrating when there's a lot of crimes around and what to be able to record and keep and eye on your property but these people are preventing them with all the vehicles to one house. Hi, for the past 3-4 years my neighbours boyfriend parks so close mostly touching. I am a disabled driver from several heart attacks and walking difficulties( knee replacement). I have had a discussion with him but his girlfriend came out and butter in screaming and shouting for no reason and generally making me feel stressed yet again. I walked away as it was stress that have caused my last 2 heart attacks. Is it worth calling the police or contacting solicitor. My next door neighbour has 3 vehicles, 1 being a work van who often takes up the space outside of 4 houses. Tried asking him to move them closer together and nothing. So my husband has sometimes overnight 8pm-7am ish had to park in the side street which has meant another neighbour bangs on our door complaining that he can't get to his garden where he parks. This man has a history of keying cars parked on the side street. His recent demand is that we park on the back street out of the way (our last car was vandalised there so no chance). He's threatened the police over it, I said to go ahead. There are 2 other side /backstreet roads for him to use but sometimes they are blocked also. HELP! Our next door neighbour keeps parking one of their cars inside the area that has been allocated to us according to the land registry documents that belong to our house. They are renting and we talked to their landlord and the landlord told us that their tenants would be informed that their parking was wrong. They still park the car inside our private area. Any advice, please? I went out with a person for three weeks and let him usey space a few times. He showed bad character and I stopped going out with the man. To annoy me he babysits the neibors children and although he doesn't use the parking space, his son in law does. Daily. It's annoying because any drlivery, visiting family members can no longer park in my spot? I let the grandfather NOT the son-in-law park there? Daily his truck is in my spot! I want the trash out! I own my flat and parking space in a privately owned block. Since I've purchased the flat the maintenance group have put in new lines which has left four of the space two small for a car. I've raised the issue multiple times with our landlord but they have done nothing. Additionally I've come home multiple time to find visitors in my space plus next doors as their are no spaces. What rights do I have in regards to this parking issue? My neighbour parks so close to my car ( which is legally parked outside my house )he actually touches it- despite there being ample space behind his car before the end of the road ( the road is a dead end and is only used to drive into our cirular close ).He has causeddamage to his own number plate from my reverse sensors -luckily the sensors seem to working at the moment.Yesterday he wrote " nutter" on the back of my bumper in car wax. Can I do anything about this intimidation and pre-emptpossible future damage to my reverse sensors -theywill become broken with continuously being driven into. Should I contact my insurance company or the police ? Looking for some advise. I live on a road with no off street parking . Parking is limited and has been first come first serve since we've lived here. Over the past 2 weeks we have had two set of neighbours say we're blocking access to their properties. Which is not the case, our car parks between the two gates and they have room to get in and out. Their gates open directly on the road (No pavement) we always leave room to walk round our car if we happen to park by there gates. But they both seem to have taken offence to us parking in front on their properties but only in the past 2 weeks? We have tried talking to them but they have both said we need to be more considerate. I asked how and they both said leave more room. Which is impossible. I explained that and they walked off?? I believe we leave reasonable room, but what are the laws around this type of situation? I live on a street which has very little parking . The street has a large number of disabled bays just out side my house there are two , in between them there are two parking spaces , one of the houses which has a disabled space regularly parks one of their cars in the middle of the two spaces to reserve a space for another car in the house meaning with one car they are reserving 3 spaces. I have left a polite notice on their car , what else can I do? For the last two years I have rented an end terraced house.There is no front garden and no access road.Below my rented house there is a row of terraced houses where residents are not able to park directly outside their house. I do not own a car. However on daily basis I have certain row residents and their visitors park on the pavement under the window of the property.In particular one resident believes parking outside my house is his personal domain and does not park anywhere else even if there is an alternative option.On a regular basis entry to my house is restricted as they park directly in front of the front door on pavement or I am forced to walk on road to gain entry to my backdoor.I am beyond frustrated as I believe they are not demonstrating any care or consideration. For the last three months I having being taking photographs of those individuals parking outside the house on the pavement.It is my intention to petition my local council to see if they will look at having designated parking spaces for residents. Please advise if there is anything else I can do.I have spoken to other residents but to no avail. Hey I need some help in terms of what I can do at my block of flats, there are 6 flats each with their own allocated parking bays, however 2 households have 4 cars which is taking up 3/4 of the lot, I have provided my deeds to prove which space I’m entitled too however they still continue to park wherever they want and become aggressive about it. A lot of people will say park somewhere else but If I do I’m then taking someone else’s and on one occasion I took the persons who took mine and he took pictures and reported me. If I can’t park in car park the next option is a narrow street which I don’t want to risk bumps to my brand new car. I don’t feel like I’m being unreasonable but I want to know what steps I can take now to resolve this, I’ve contacted their letting agent who said they don’t think it is allocated. One of their landlord actually knows it is because he told me which was his on one occasion, I’ve found his address and Facebook page through a google search should I message him and say can you help or just go down a more formal route. We have lived in our Close for the past 3 years. Most days there are at least 3 cars parked opposite our bungalow from 6am to 6pm. These are left by commuters who are builders waiting for their lift to arrive. Sometimes this occurs at weekends . No obstructions as such but our road drops down a very steep hill and these cars obscure driving view. There are double yellow lines from the main road up until our bungalow which is two bungalows from road entrance then the lines stop. So these vex hikes are parked from end of lines for a distance taking them to the steep hill. Council, MP, do not want to know. It would be different if neighbours parked but not inconsiderate workers. We have been told that we have to leave a property because we hadn't removed sign writing on our vehicles, we were told after our tenancy had started that the close wherewe livehas a no commercial vans covenant, we only have two vans no cars so this was a shock...now we have been told they won't renew the tenancy...the neighbours have been this ones pushing for this and also don't like us having any visitors with cars, there is a half moon space directly on front of our house which original we were told was ours along with the 2 car drive however the neighbour said no its a spare for whatever, the neighbour who causes the trouble has her sister to stay or at least leave her car here for a week or less and we normally make sure we don't park there but as we were late last night and slept later than normal we had not moved from yesterday, now we come out this afternoon to find the neighbours car parked on our front lawn...what can be done? I live in an avenue where one side of the houses are council properties and the other side are privately rented or owned. There are 6 spaces dotted around the avenue for parking and if you don’t get one of these spaces you have to just park on the road. There is no signs stating parking is for council residents only and we do all live in the avenue however I’ve started parking in one of these spaces and have started to get a lot of abuse of the council property neighbours saying they belong to them and I have no right to park there. If there is nothing stating that this is private parking and I do own a house on the avenue do I have the right to park in these spaces and could the council clarify this for me? I live in a narrow lane. I park on my drive but reverse out into the small bay of the park directly opposite my house. Sometimes people park in this bay to walk dogs or just because they want to park there, which makes it difficult but not usually impossible to reverse out. Recently I reversed into someone’s car parked in the bay. Who is liable in this instance? We give opinions on individual liablilty on this page unfortunately.